Alban Corinis, an Imperial knight, is a test character used for testing NPC moods and dialogue. He is often found in test cells created by Todd Howard. All three versions are equipped with a full set of elven armor except the shield. Version 1db45 is armed with an elven long sword and elven shield, version 4f125 is armed only with an elven long sword, and version 4f126 has only a steel warhammer. He is the Imperial seen on promotional trailers and pictures. Aside from generic dialogue, Alban is voiced by Todd Howard. When speaking to Alban for the first time, his intro dialogue is subtitled "Yes? How should I act? ", but the actual words spoken by him are "I knew one day someone with unyielding virtue would heed my words and speed my release. You risked much to perform such a selfless act. ", the words spoken by Grantham Blakeley when his skeleton is unlocked, except they are spoken in an Imperial voice and do not have the ghostly effect. 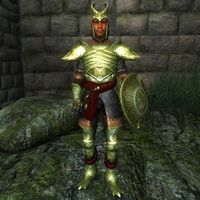 The proper Todd Howard voice file exists on the Xbox 360 version of Oblivion, however it cannot be accessed without ripping the files from the disc or using a modded save to get to one of the rooms with Alban in it. This page was last modified on 12 May 2018, at 04:52.